Here is the perfect crochet baby blanket for wrapping up your newborn baby girl. This lovely afghan crochet pattern from Lily Sugar n' Cream features adorable rose and white motifs with an eyelet design. 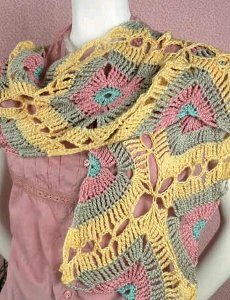 Curl up on a chilly evening with this homemade crochet afghan to keep you and your baby warm and cozy. It's also a great accent piece to put on a little girl's bed or to give as a baby shower gift. Best of all, this easy crochet pattern doesn't take long to make. What are you waiting for? Get started! For more adorable baby blanket patterns, check out these 41 Easy Crochet Baby Blanket Patterns, Free Tutorials and More. Size: Approx 40½ ins [103 cm] wide x 48½ ins [123 cm] long. Gauge: Motif = 8 ins [20.5 cm] square. With MC, ch 5. Join with sl st to form a ring. 1st rnd: Ch 3 (counts as dc). 3 dc. (Ch 3. 4 dc) 3 times in ring. Ch 3. Join with sl st to top of ch 3. 2nd rnd: Ch 3 (counts as dc). 1 dc in each of next 3 dc. (2 dc. Ch 3. 2 dc) in next ch-3 sp. *1 dc in each of next 4 dc. (2 dc. Ch 3. 2 dc) in next ch-3 sp. Rep from * twice more. Join with sl st to top of ch 3. 3rd to 7th rnds: Ch 3 (counts as dc). *1 dc in each dc to next ch-3 sp. (2 dc. Ch 3. 2 dc) in next ch-3 sp. Rep from * 3 times more. 1 dc in each dc to end of rnd. Join with sl st to top of ch 3. Fasten off. With A, work as given for Motif A.
Crochet motifs tog as shown in diagram below. 1st rnd: Join MC with sl st to any corner of Blanket. Work 1 row of sc evenly around, having 3 sc in corner ch-3 sps. Join with sl st to first sc. 2nd rnd: Ch 1. Work 1 row of sc evenly around having 3 sc in corner sc. Join with sl st to first sc. Fasten off. Find even more fun and easy crochet patterns here: 50+ Free Easy Crochet Patterns and Help for Beginners. Where do I find out how to read the instructions - I've figured out dc (double chain) and some of the others but is there a reference doc? Nevermind - found it on Google - DUH. DC isn't double chain, it's double crochet. Google the terms you don't understand or search youtube. This is one of the easiest and the prettiest aftgans I have done. It was easy as you only had to make one block at a time. I put a ruffly edging on it.....and it is just a delicate looking aftgan. Congratulations, Betty Joyce for having done this project. How do you sew them together. Doesn't show to sew the Motifs together. I love to make this. I think this is such a soft and light looking afghan. It does not appear to be heavy and I can see the subtle colors fitting in anywhere in the house. Lovely pattern. This is so pretty. I'd like to make one for each of my three children in different colors to match their personalities. Thanks for posting. The diagram is just showing you the placement of the motifs. It doesn't show you how the sew them together. Good point. They should show how to attach each motif. Check out the Lilly website - pattern is free and has diagram for color placement. Where is the diagram showing how to crochet motifs together?